An example of a consumer-grade dehumidifier. My humidifier/dehumidifier doesn’t seem to blow as much air as it used to (i.e. the volume of air flow has decreased) – what do I do? Also, the humidified air sometimes smells. Can I do anything about that? These issues are normally preventable and related to routine maintenance of your equipment. 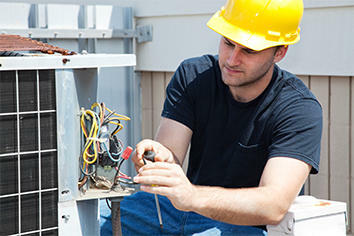 Depending on the type of equipment in use at your home, you may or may not need professional service. For example, consumer-grade equipment can often be serviced by simply scrubbing down the unit’s removable water tank or cleaning and replacing its evaporator belt or evaporator pad. Equipment that is incorporated into a central HVAC system should be serviced regularly by professional technicians as part of a routine preventive maintenance program. Great question! First, let’s clarify which pieces of equipment we’re addressing, as humidifiers and dehumidifiers are often confused with each other and misapplied in certain circumstances. Humidifiers add moisture to the air, while dehumidifiers remove moisture from the air. These are two separate devices. The need for dehumidification is generally in the air conditioning season (summer), while humidification is normally necessary during the heating season (winter). Central air conditioning systems actually act as dehumidifiers to a certain extent when operating in cooling mode (thus, the term “air conditioning” rather than merely “air cooling” – the unit helps to condition the air rather than just cool it). If necessary or preferred, humidifiers can also be added to the home’s forced air duct system to expel moisture into the air as it circulates throughout the home. Apart from central HVAC systems, consumer-grade humidifiers and dehumidifiers can be purchased at local retail stores or online and installed relatively easily in any residence. Independent dehumidifiers are often placed in basement or crawl space locations, while independent humidifiers may be located throughout the home as needs vary from room to room. As for the smell and air flow volume issues mentioned in the question – most such issues can be avoided with routine maintenance. For example, many humidifier units use a media pad that needs to be cleaned or replaced on a regular basis depending on the water quality in the home. Other parts of the equipment’s internal workings (tubes, valves, and such) may also require routine cleaning or repair. Central HVAC-based humidifier and dehumidifier equipment should be serviced regularly by professional technicians as part of a routine preventive maintenance program. Independent, consumer-grade humidifiers and dehumidifiers should come “out-of-the-box” with cleaning and care instructions that can be performed fairly easily by the homeowner. For example, removable water tanks on humidifiers should be scrubbed regularly to prevent mold and bacteria build-up as well as unwanted smells. Additionally, mineral build-up on the evaporator belt or pad may cause a decrease in airflow volume; as such, the belt or pad may need to be cleaned or replaced. Again, if you’ve purchased consumer-grade equipment at a retail store, please refer to the manufacturer’s instruction manual for specifics. Humidifiers and dehumidifiers help to keep your home comfortable year-round. If this equipment is incorporated into your home’s central air system, it should be regularly maintained by qualified service technicians like those at Tuckey Mechanical Services. If you’ve purchased independent humidity-control equipment at a retail store, please refer to its instruction manual for care and maintenance guidance – and if you need professional assistance, give us a call. If you’re interested in adding humidity-control equipment to your home’s central air system, we’d be happy to provide guidance and a proposal. Installation, emergency repair, or routine maintenance – Tuckey Mechanical Services stands ready to serve you 24/7/365!